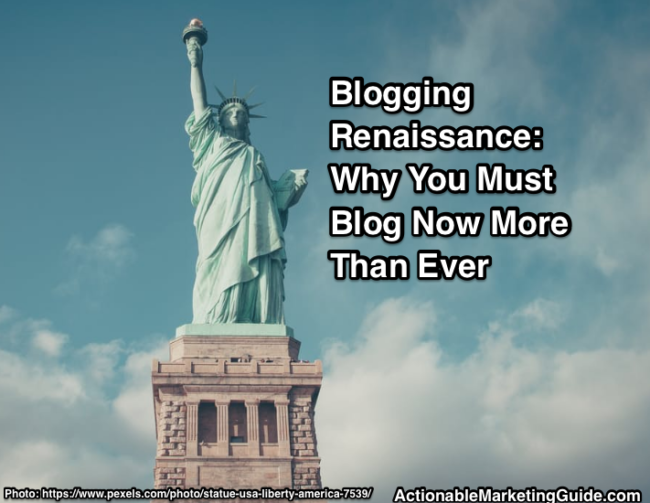 Now more than ever your business needs to tap into the blogging renaissance. Blogs are no longer shiny new objects of marketing adoration. Blogs date back to the late 1990s. They grew out of ideas documented in The Cluetrain Manifesto. Over time, blogs have become marketing stepchildren. They lack the love and connection to the business’s core marketing strategies and plans. Even small businesses pulled back on blogging. But in 2016, the Inc 500 increased their blogging efforts according to University of Mass/Dartmouth research. Blogging pioneers, Copyblogger’s Brian Clark and Problogger’s Darren Rowse, are leading the blogging renaissance. It’s documented in their discussion “Blogging Is Back”. 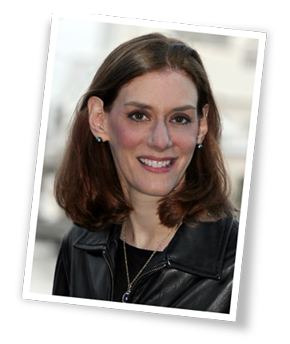 They want to recapture the power and human essence of blogging, especially as an owned home base. Audiences across a wide spectrum of interests find themselves in a barren no man’s land of empty information. They’re looking to make a connection with the content they read. They’re caught between unreliable but ever-present salacious fake news and bland, me-too content marketing. To succeed, fill your business blog with a transfusion of human crafted information your audience actively craves and seeks. With the proper guidance and resources, transform your blog into a lead generating star by providing the information prospects, customers and others want. 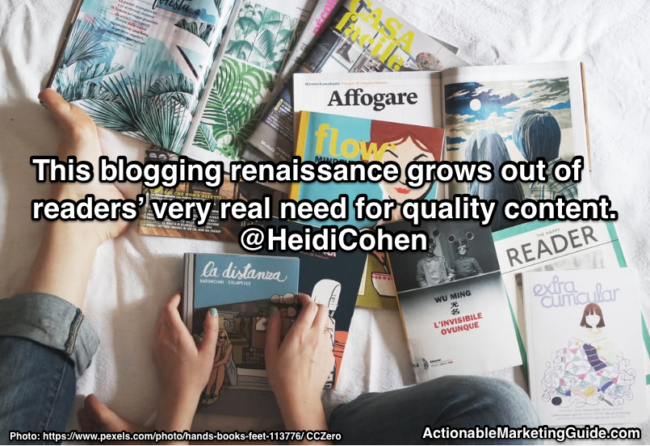 To get your marketing team motivated, understand why the blogging renaissance is taking place now. 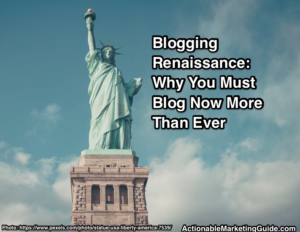 Here are the 5 main reasons for the blogging renaissance. During social media’s rise, many businesses believed they no longer needed a blog. 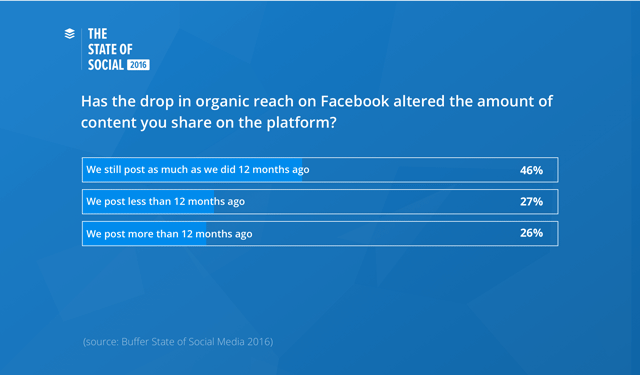 Building a presence on “free” sites like Facebook kept businesses top-of-mind. 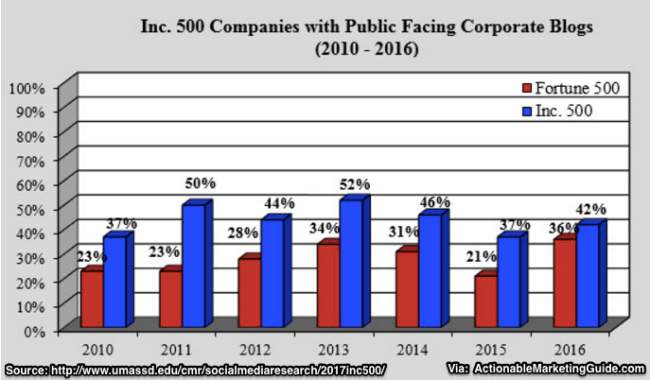 Now, social media is maturing and consolidating. Facebook and other platforms are no longer a “free lunch”. Translation: Businesses must maintain an active Facebook presence and invest in Facebook advertising. Build your blog as your owned media presence. Don’t assume your existing blog will meet the new competition for reader attention. Audit and plan your blog content themes and editorial calendar. 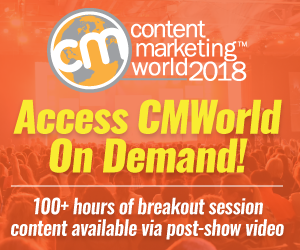 Create audience-focused content to be the best answer when your audience needs content! Make your blog posts support your sales process. Before you plan and produce your blog content, assess your audience’s needs. Think of your readers. Include customers, employees and promoters. 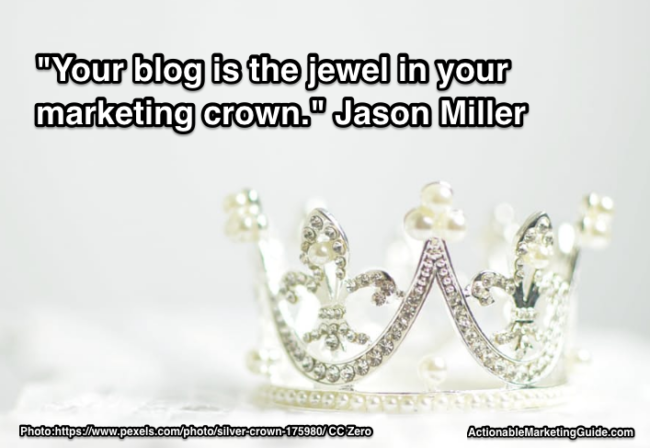 “Your blog is the jewel in your Marketing crown.” @JasonMillerCA via @HeidiCohen. 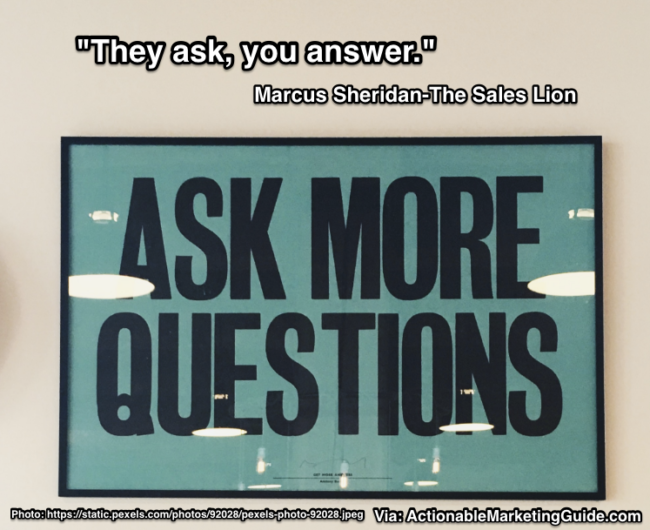 “They ask, you answer,” according to The Sales Lion, Marcus Sheridan. Regardless of your product or service offering create a blog post to answer every question your prospects, their purchase influencers and end-users have. Include the tough ones like price. Make them accessible. Use your customers’ language and add visuals. Work with sales, customer service and investor relations to answer customers’ questions. Transform this information into human sounding content employees can use reducing redundant work. 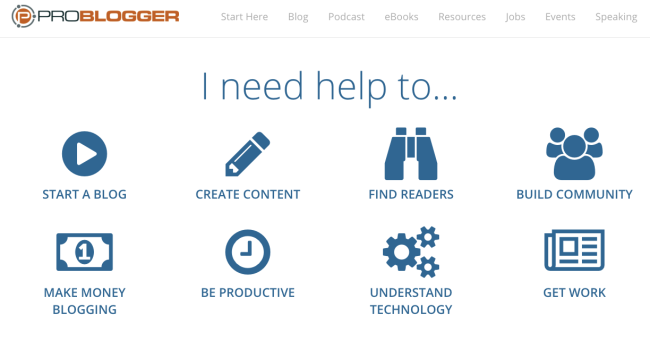 Apply a publisher mindset to your blog. Your blog is a media entity. Think like one! Publish blog posts on a consistent basis to become expected content and establish your presence in your specific niche. 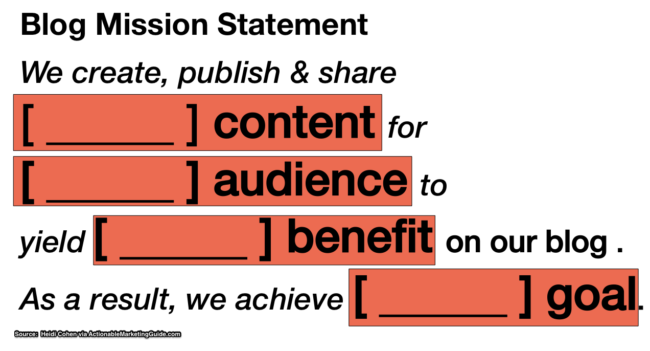 Focus on your documented blogging mission statement. Don’t limit your marketing worries to Google and Facebook. Together they control 75+% of digital media budgets. Amazon, Apple and others (like Yelp and TripAdvisor) have become primary destinations for specific information types. 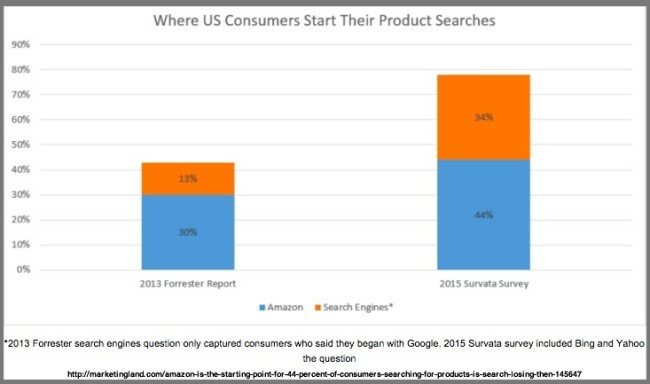 Amazon is the first place shoppers turn regardless of where they ultimately purchase. As the granddaddy of ratings and reviews, it’s no surprise. Amazon monetizes this traffic with targeted advertising. Amazon is also the go-to book site supported with Kindle and its relatively low hurdle e-publishing platform. Similarly, Apple controls music and app search through the iTunes store. 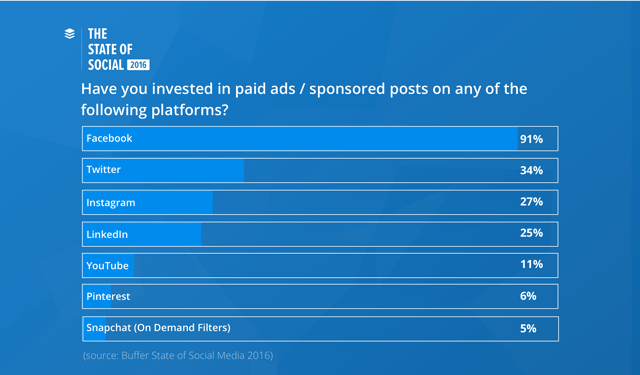 As a result, the power and reach of third-party content and its advertising continues to erode. You need your own media presence. 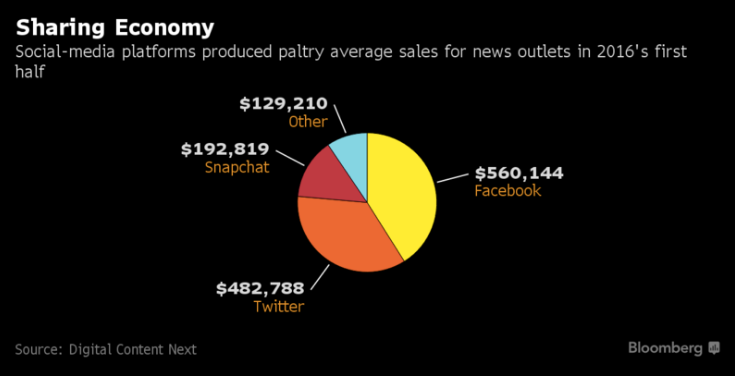 This chart reveals that social media platforms don’t perform for news media. Build and expand your blog audience like a media entity. Use every contact and piece of content and marketing collateral to accomplish this. Your target audience must be able to find your blog content. They use a variety of methods to seek and gather contextually relevant information. Organize your blog content so readers find the information they want when they want it. Your posts can’t look like a bunch of post-its randomly stuck onto your blog without thought or organization. This is neither visitors nor search-friendly. 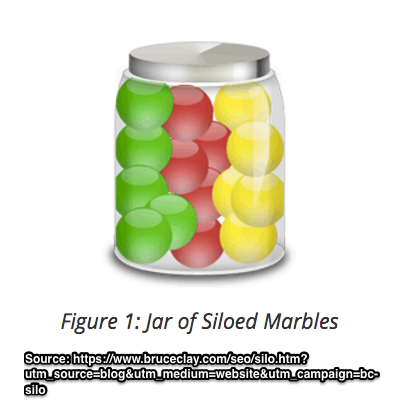 SEO expert Bruce Clay refers to this as creating silos for your blog. The objective is to align your key topics to link them internally and make them findable on your navigation. This improves findability. Take advantage of other search-worthy options. Specifically tap into the power of Pinterest, YouTube (the second largest search engine after Google) and podcasts. Include appropriate keywords in descriptions. Utilize blog content and structure to improve product findability. 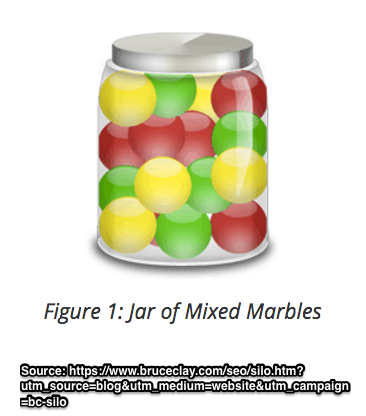 Incorporate visuals and related text in blog posts. Include the words your audience uses to seek your products. Put these words in your URLs and image captions. Use your business blog to connect with influencers while fostering your thought leadership. Help people who’s attention you want to attract. Support your content marketing and social media needs by spotlighting top influencers in your niche. Mention them and link to their websites and blogs. Depending on your blog offering, interview influencers allowing them to tap into your blog’s reach. For example, Actionable Marketing Guide interviews authors to help broaden the reach of their books. Podcaster John Lee Dumas of Entrepreneur On Fire interviews well-known entrepreneurs to help listeners improve their business. Consider influencers broadly. Include your customers and fans, your employees and niche thought leaders. 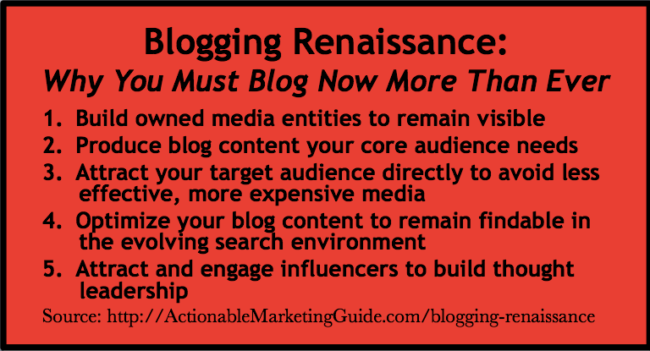 The blogging renaissance is gaining traction. Now is the time to include your blog in your marketing strategy. Make sure your business doesn’t get left behind without an owned media entity. Integrate your blog into your content marketing and social media editorial calendars to fill it with quality content, not leftovers. Rejuvenate your blog with life-sustaining quality content. You’ll start to build relationships and qualify sales leads while building your company’s thought leadership and house file. Even better, your blog will support other marketing efforts consistently while balancing your workload and resources. Tags 2017 B2B Content Marketing Research, Brian Clark, Bruce Clay, Buffer, Cluetrain Manifesto, Darren Rowse, Jason Kint, Jason Miller, Marcus Sheridan, UMass Dartmouth Research. Bookmark the permalink. 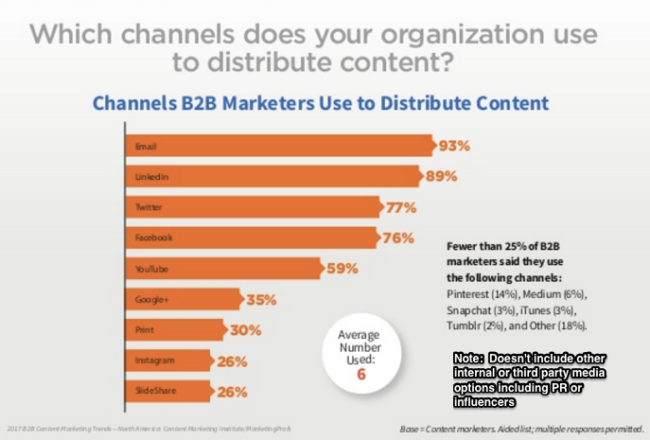 ← Content Marketing Audience: Do You Know Your Readers?